THE iconic Baskerville Raceway in Old Beach has secured a naming sponsor partnership for the first time in over 30 years, officially making the much-loved track the Pepsi Max Baskerville Raceway. BRIGHTON Council is establishing an Access Advisory Committee and is seeking community nominations. OUR emergency services play a vital role in the community, ensuring public safety and ready to act as a first response in the event of a fire, accident or serious incident. The police, fire and ambulance services and the State Emergency Service are all important to the health and wellbeing of the Brighton community. THE very successful Breaking the Silence Group recently held a launch of its ‘Hidden’ resource pack at Parliament House. The event, which was hosted by Speaker of the House of Assembly Elise Archer MHA, was well attended by members and friends of the group along with politicians from all sides of politics. House of Assembly Speaker Elise Archer with advocacy group member, Shirley Williams. A DRAFT report of the Brighton Tomorrow project, an urban design study undertaken by architecture students from Monash University and the University of Tasmania and commissioned by the Brighton Council, will go on public display shortly. THE Glenorchy Knights Football (Soccer) Club is doing great things in the Northern Suburbs to promote the game of soccer and creating opportunities for junior players. 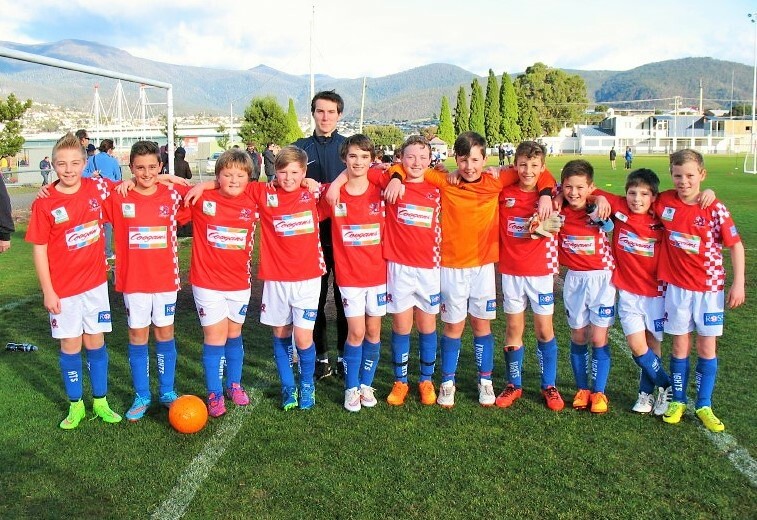 One initiative of the Glenorchy Knights this season was to invite junior clubs in the northern suburbs to attend PS4 Victory League games at their KGV home games in Glenorchy. Junior players from Brighton Junior Soccer Club and Derwent United Football Club recently attended these games. The players walked side by side with senior players onto the pitch and stood with them while they were introduced to supporters attending the game. They were also allowed to act as ball retrievers during the game and get to play a small-sided game on the ground at half time in front of supporters. The U12 SAP Team players are from back, left, coach Daniel Harris with Dylan Midson-Laredo, Lucas Dzelalija, Lachlan Nilsson, Joe McShane, Peter Swan, Josh Honig, Blake O’Brien, Harrison Huigsloot, Brayden Butler, Jayden Nube, Ziggy Gow-Webb. THE Tasmanian Government has allocated funding for the design and construction of a new roundabout at the junction of Cove Hill Road and the East Derwent Highway. This work will improve safety by allowing traffic from Cove Hill Road to safely access Green Point Road using a new roundabout. Work will also include closing the old link from East Derwent Highway to Green Point Road which has a high accident rate. 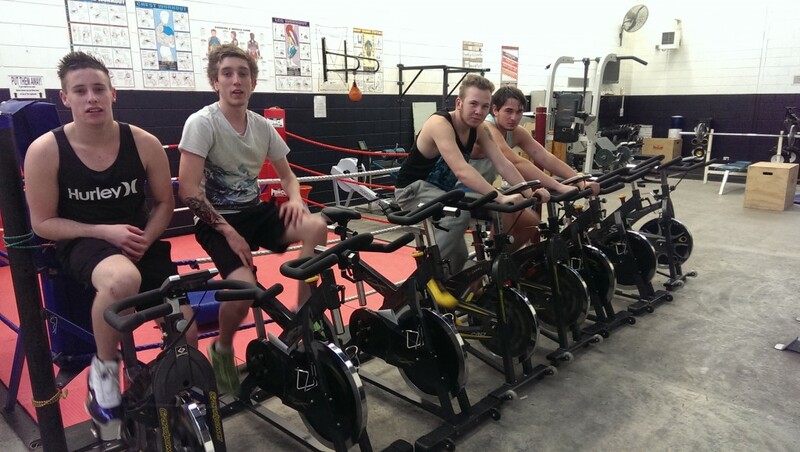 MORE $8,900 has been granted to the Bridgwater Police and Community Youth Club (PCYC) to operate a youth fitness and health program, and purchase four new exercise bikes, thanks to the MyState Foundation 2015 grants program. Bridgewater PCYC CEO Senior Constable Bryon Howard said the youth health and fitness program aimed to change the lives of young people in a practical manner, with a vision to break the cycle of intergenerational poor health outcomes in the local area. From left, Harley Banks, Darren Watkins, Dylan Armstrong and Josh Mayne.